I’ve never been a Halloween type of person. I have legitimate reasons for this: outside of the US, it just isn’t a big deal. Certainly not in Belgium, were you might buy a costume in the supermarket but nobody goes trick-or-treating. This year, however, I’m invited to a small Halloween party at my friend Vanessa’s (who grew up in the US, so I assume she’ll know how to throw a good party!). So I will dress up and go out, for once. Plus, all these cute Halloween recipes have been flooding my Bloglovin’ dash and despite myself I got a just a little bit excited. When I saw this recipe on the Food Network’s twitter feed, I was sold. I had to try them! 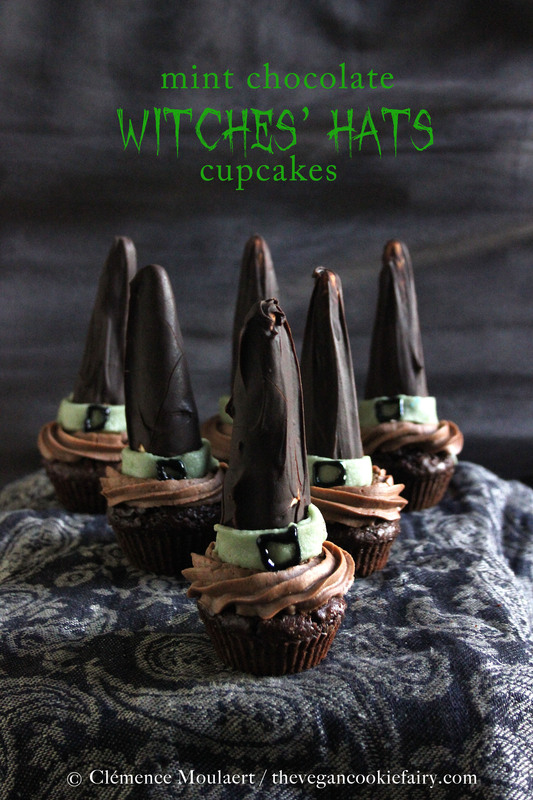 How cute are my witchy cupcakes, eh? They’d make a killing (hehe) at a Halloween party, especially for kids. They’re super fun to make, and because there are quite a few elements to put together (cupcake + icing + cones + decorating) you can make this a group effort. Ding dong! The witch is dead! The wicked witch is dead! Notes: The buttercream recipe makes plenty extra – use to decorate a cake or just pig out and have it as pudding. 1. Pre-heat the oven to 180ºC (350ºF). Line or grease a dozen cupcake moulds. 2. In a cup, add the soya milk and apple cider vinegar and set aside to curdle. 3. Sift the first three ingredients for the cupcakes into a large mixing bowl, and add the brown sugar. Fold in all the wet ingredients. 4. Pour a generous tablespoon of cupcake batter into each cupcake mould. Bake for 20-22 minutes, then cool on a wire rack. 5. Meanwhile, prepare the buttercream: whether using electric beaters or beating by hand, it’s best to start beating all of the butter and some of the icing sugar with the mint extract and cocoa, adding a little icing sugar at a time. The buttercream should be fairly stiff by the time all the sugar is used. Refrigerate until needed. 6. When the cupcakes are completely cooled, cut a small cylindrical hole out of each cupcake by using an apple corer. Mix the ingredients for the mint coconut cream filling in a small bowl and pour into the holes in the cupcakes. You will have leftover cream. 7. Ice the cupcakes, using a large star-shaped nozzle and starting out from the outside, circling the cupcake to finish at the centre of the cupcake. Refrigerate for now. 8. Melt the chopped chocolate, soya milk and coconut oil in a medium-sized saucepan on medium heat. Stir continuously with a wooden spoon to prevent the chocolate from burning. When it’s completely melted, remove from the heat. Dip in the twelve ice cream cones (this will get messy), then place them, hat tips up, on a wire rack. Place in the fridge to set more quickly. 9. Roll the marzipan and food colouring into a uniform ball. Roll out flat on a clean surface to about 3mm thick, and cut into thin strips of about 5 cm (2 inches). 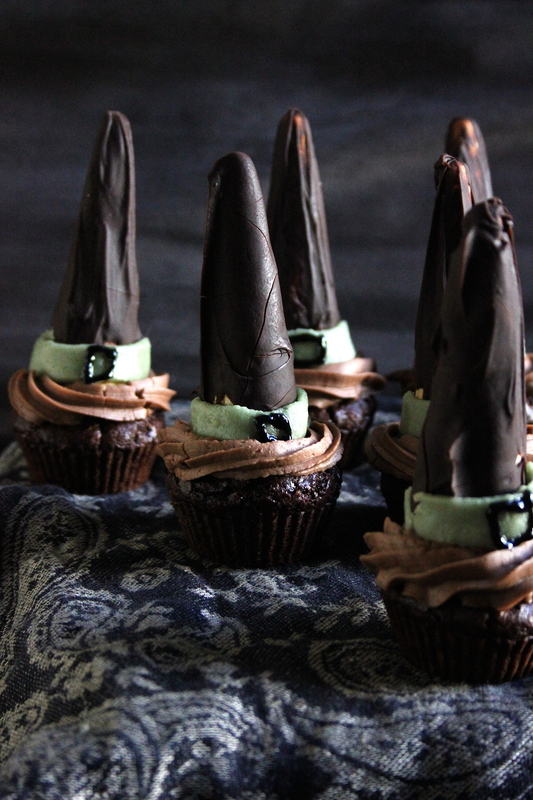 Wrap these around the base of the cones to form a ribbon on the witches’ hats. Use the black cake decorator pen to to draw a black square, like a buckle, on the green ribbon. 10. 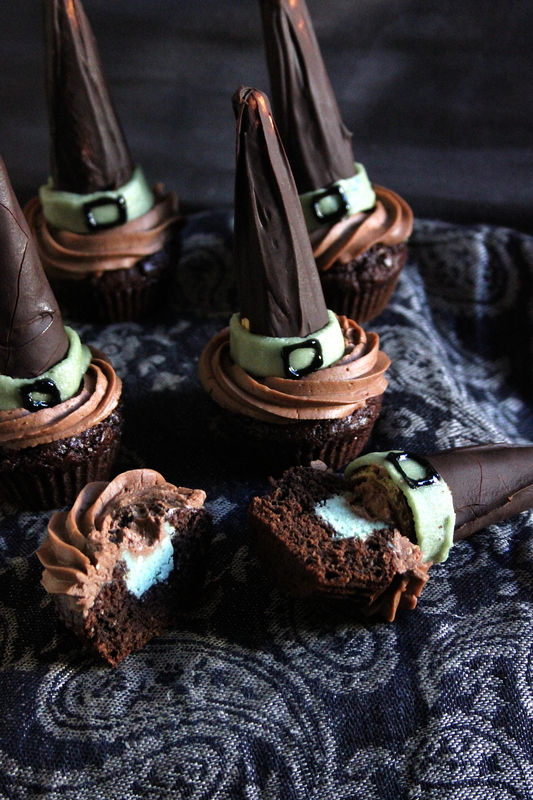 Lastly, pin the hats onto the iced cupcakes. 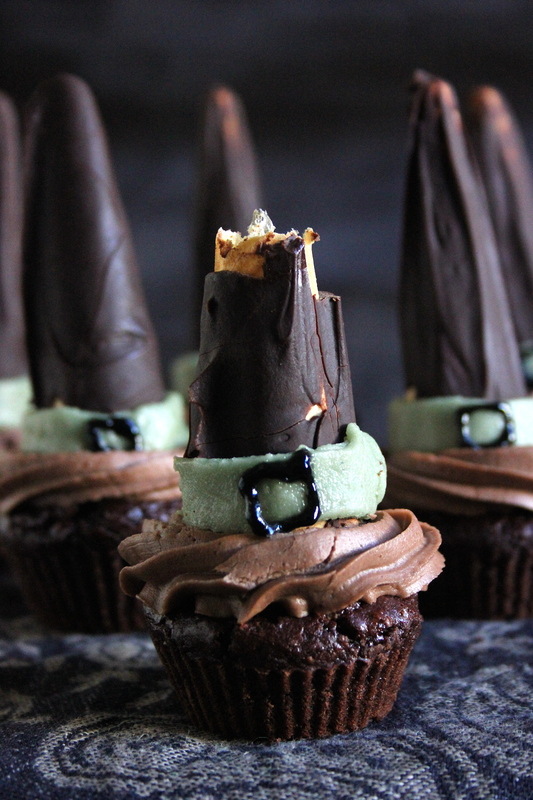 Enjoy within 1-2 days as the cupcakes will get a bit stale after that and the cones will lose their crunch. These are so cute! I would be so happy to eat these haha. Halloween is big here in Canada, but I’ve never loved it much. It does mean Christmas is closer though! I miss you too! Come up here! Everybody move to Scotland! Your view on Halloween is exactly the same as mine. I’ve gone to a few Halloween parties in the past and enjoyed the traditional games but I’m much more excited about Christmas!